Sure, there are plenty of shows to enjoy at the casinos on the Strip. But the kinds of productions you’ll see at the Smith Center for the Performing Arts are of a different variety. 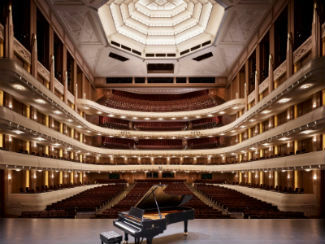 Not only does the Smith Center host traveling Broadway shows and renown performers, it's home to the Las Vegas Philharmonic and Nevada Ballet Theatre. 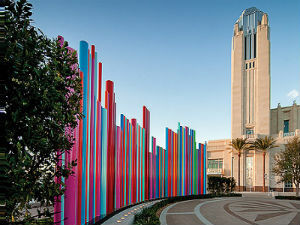 Since opening in 2012, the mission of the Smith Center has been to present and develop a wide range of performing arts in Las Vegas. It was designed as a world-class center right down to its Art Deco architecture and 170-foot tall carillon tower. As part of a major effort to revitalize Downtown Las Vegas, the Smith Center aims to inject a much-needed dose of culture and fine art to the area. The Smith Center for the Performing Arts would not have been possible without the Donald W. Reynolds Foundation, which donated $150 million to the project in 2005. This donation, which was the largest ever in Nevada, was combined with public funds to finally provide Las Vegas with its first performing arts center. Built atop a former railroad switchyard, the center took more than two years and $470 million to complete. The final construction includes three theaters — Reynolds Hall plus the smaller Cabaret Jazz Theater and Troesh Studio Theater in the adjacent Boman Pavilion. A courtyard separates the two structures. In a city filled with resorts designed to replicate other places, the Smith Center has a look that’s uniquely Las Vegas. The architecture was inspired by the iconic Art Deco stylings of the Hoover Dam. This is especially evident inside the Grand Lobby of Reynolds Hall, which houses a 17-foot bronze statue modeled off the “Winged Figures of the Republic” statues atop the dam. The Grand Lobby features many other references to elegant 1920s design, including towering chandeliers, marble floors and central staircase. 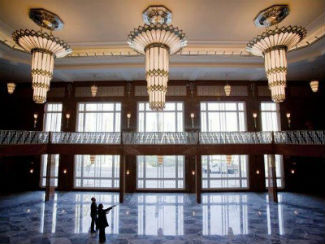 The Art Deco design is also apparent from the building exterior, which was made from Indiana limestone. The focal point of the building is the 17-story carillon tower, which houses 47 bells. The Smith Center carillon rings periodically. The showcase of the Smith Center is the larger concert theater in Reynolds Hall, which seats 2,050 and hosts most of the plays, musicals and bigger performances. Seats can be accessed through the Grand Lobby and mezzanine level. Drinks and snacks are sold at bars located on all levels. The mezzanine level also features the mezzanine lounge and the Founders Room, both of which feature bars. An upper lobby is also accessible to guests one level higher. This lobby provides great terrace views and the Carillon Salon under the bell tower. The 258-seat Cabaret Jazz Theater in the Boman Pavilion is designed for more intimate shows. As its name implies, energetic jazz performances are often booked in this venue. Adjacent to the Cabaret Jazz is the 250-seat Troesh Studio Theater. This venue is used for rehearsals as well as children’s theater and community events. One level of the Boman Pavilion is dedicated to the Elaine Wynn Studio for Arts Education. The Smith Center is perhaps most known for bringing in traveling Broadway shows such as "Ghost The Musical," "Book of Mormon" and "Wicked." These shows may run from a few days to over a month. Reynolds Hall is also known for hosting big-name music performers such as John Legend and Diana Krall as well comedic or one-man shows from William Shatner and Jerry Lewis. Tickets for these shows go anywhere from $30 to $120, which can be more affordable than most Strip productions. The Las Vegas Philharmonic concert season runs from the end of September through May and usually consists of 10 shows. The center is located Downtown in Symphony Park, which is less than a mile from the Fremont Street Experience. 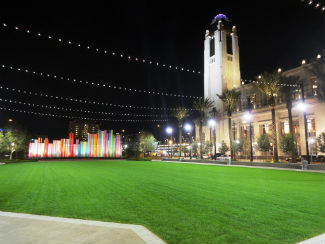 Symphony Park is a 61-acre mixed-use urban community that is being continually developed and currently includes City Hall, the Lou Ruvo Center for Brain Health and the Discovery Children's Museum. The Smith Center sits within the Civic District and is directly next door to the Discovery Children's Museum and its parking garage. More parking is available via free surface parking across the street from Reynolds Hall. A $5 pay lot is located closer to the Civic District while shuttles run to and from the free lots. Valet services at Reynolds Hall are provided for $10.